by Jan Kučera, last updated: 11/29/2009. Fixed: 64-bit .NET Framework throws a NotImplementedException (wow) when trying to load BAML from 32-bit libraries. Solved by rebuilding for x86 instead of AnyCPU (thanks to William and Innovactive for reporting and sending reports). Fixed: The utility was crashing under .NET 4.0 when loading libraries marked as coming from internet (some unpacking applications do mark them so). Full trust of the libraries is still required, but lack of it no longer crashes the tool (thanks to Simon Taylor). Not so unexepectly, final version of .NET Framework 4.0 introduced some breaking changes from RC. The tool was modified and recompiled to work with the release version. The .NET Micro Framework has special blocks of memory dedicated to the configuration data. This is where settings like the device IP address are stored. I am not sure how much this is known, but apart from these built-in configurations, the porting partners are allowed to use this feature to store and use their own, hardware-specific configuration data. Unfortunately, there is no tool to read or write such data (except MFDeploy, which provides access to the in-box ones (network, USB and SSL settings)). This might be the reason why this great feature is so rarely used, which is a pity. I hope that this tool will help both developers and hardware vendors to take the advantage of configuration sectors and simplify the device management. All connected devices can be seen at once, by utilizing a tree instead of pair of comboboxes. Connecting and working with multiple devices at once is supported. Complete device port information, selectable to be copied. Non-modal connecting and other busy operations attempts and errors, with progress info in tooltips. Offline mode - all cached info persisted and available even when the device is disconnected (eg. during device restart). Pinging returns flags (not parsed yet), the reply duration and is modal allowing you to continue pinging by pressing a single key (pinging is place for improvement). Restarting the device with several options (CLR only, enter boot loader, etc. - see buttons's context menu) (also to be improved). It is possible to connect to devices which use different ports for TinyBooter and TinyCLR (although currently a bit tricky to do). List of running emulators available... well, just a list, you know. Easy MFDeploy and SDK command line startup using tasks on Windows 7. All available firmware info, including HAL, CLR and OEM versions and other data. Grabbing the display image - this command was deprecated on Microsoft side and no current hardware supports it. List of supported and unsupported device capabilities. General output from the device, including command and noise data, with an export to file ability. List of deployed assemblies, their version and status. List of application domains and their state. Switching to TinyBooter (and back) automatically, only when needed. List of configurations present in the device. Template view for quick, user friendly settings. Property grid for advanced options, supporting documentation of inividual settings. Raw view including configuration header for experts and hardware vendors. Unfortunately, this view is currently read-only, developing an editable hex-edit control is not that easy, even in WPF. Fully extensibile using 3rd party libraries. Tha last point reveals the key feature and purpose of this tool. Anyone can supply their own configuration definitions and templates. See the documentation for developers. It also wouldn't be difficult to make the tree extensible - if you were interested in extending the tree, please contact me. How is this different from MFDeploy? MFDeploy can deploy assemblies and erase memory. This tool can't (yet). I'm considering adding this functionality if you would be interested. You can also give me some ideas on what do you miss in this area with MFDeploy. On the other side, MFDeploy can only read and set the built-in configurations. This tool allows you to edit any configuration the device may contain including hardware specific, and even create a template for it. The Emulators node says Access denied. What's up? Administrator rights are required to be able to enumerate running processes. Since emulators currently do not support any control from external process, enumeration is the only thing you can do. Therefore no reason for the tool to require elevated privileges by default. Why is there the Emulators node at all then? All tranport types defined in the .NET Micro Framework debugger assemblies are shown. I'm not going to rebuild the tool every time just because a transport type was added, removed, or implemented. Which nodes support device auto-discovery? Only the USB one (and the emulators one, but see the first answer). These nodes will automatically show or hide any connected or disconnected devices. How do I discover devices on ethernet? Select the Ethernet node and click the Refresh button in the command bar. Can I manually put a device into offline mode? Yes. Click the Disconnect button in the command bar. How do I bring such device back online if the transport does not support auto-dicovery? Click the Refresh button in the command bar. How can I disconnect the device completely? Click the Disconnect button in the command bar while having the device offline. The device will be removed from the tree. How do I get manually disconnected devices back to the tree? Select the desired transport type and click the Refresh button in the command bar. How can I connect to a device using different transport types for TinyBooter and TinyCLR? 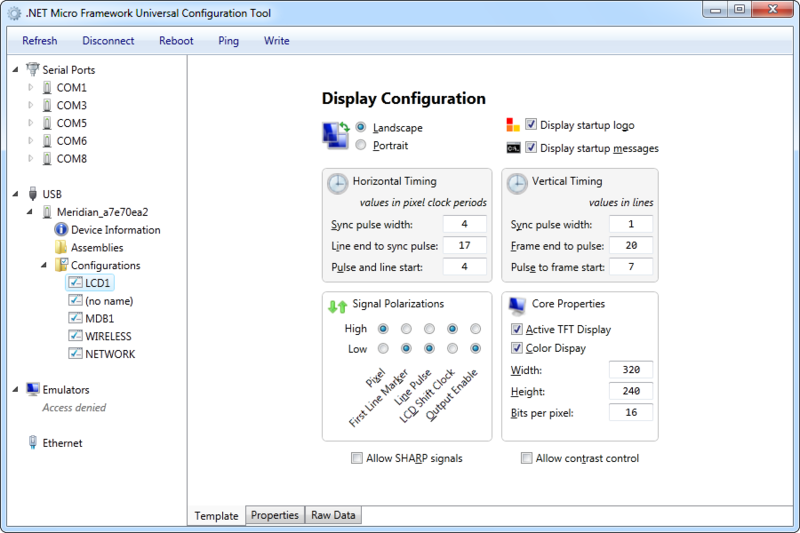 TinyBooter connection is needed to get the configurations only, and all connections by the tool are delayed until needed. So you can expand the tree from the transport type of TinyBooter down to the configurations node and work with the configurations, and use all other nodes on the TinyCLR transport type. The only device as far as I know which requires this setup is the AUG AMI DevKit (serial port + ethernet). Changing the rotation of Tahoe display does not work, although the configuration was successfully written. What should I do? Start a managed application. Debug information and Device Solution's logo are not affected by this setting. After working with configurations, the device keeps booting into TinyBooter. How to switch it back? You need to talk to TinyCLR. Select the Device Information while the device is in the TinyBooter. If the content is cached, click the Refresh button in the command bar. This download requires you to sign in using Windows Live ID. .NET Framework 4.0 runtime required, which can be downloaded here. The tool might crash upon exit, and not so rarely. This is known issue and can be safely ignored. Library for MDB1 and LCD1 configurations for Device Solutions. At least 4.0.40141.6796 firmware version is required for Tahoe-II to support display rotation and logo/info hiding. WIRELESS configuration and SSL support will come in next release. These require access to the device and I have not decided yet how to pass it to the libraries. If you have any opinion on this, let me know! Does not even start on my Win7 64 os. No error. Just double-click and nothing. On my Win7 64 tool crashes, too. Now it works! Thanks Jan.
HI, I am trying to run this tool on win8 (64bit) os, but is does not run at all. no error. do you still support this tool?